The Willamette Valley of western Oregon is a premier seed production region, especially for clovers and cool-season grasses. In 2017, 35 million pounds of legume seed was produced on over 48,000 acres in the Willamette Valley. Farm gate sales accounted for over $43 million. 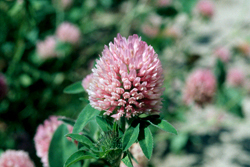 The clover seeds grown in Oregon are primarily red, crimson, arrowleaf, and white or Ladino. 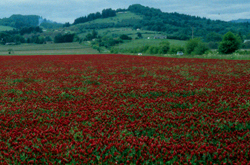 Red, crimson, and arrowleaf clover seed is grown mostly in the north valley (Washington, Yamhill, and Polk counties). 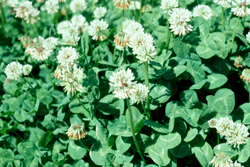 White clover seed is grown in the south valley (Linn County). About 1,500 acres of red, crimson, and arrowleaf clovers for seed are grown under irrigation in other areas of Oregon. Small acreages of legumes including alalfa, common vetch and hairy vetch are also grown in the Willamette Valley. Red clover is a perennial. In the Willamette Valley, it is commonly planted in the spring, but may also be planted in August or September, especially if the grower can irrigate. In late May the plants start to bloom, but growers cut the fields for forage around this time. The purpose is to delay the bloom so that all the flowers come at the same time. Most growers sell the forage as green chop to dairies. Even if a grower does not sell the forage, he will clip the field, because a uniform bloom is important for seed production. Seed is harvested in August and September. 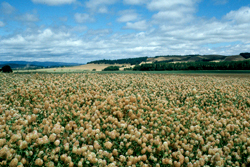 White clover seed in the south Willamette Valley is grown primarily for the soil quality benefit it provides to the grass seed crop following it. White clover is a perennial that spreads by stolons. Seed growers plant in rows up to 20 inches wide to allow room for stolons to grow. They deliberately stress the plants by grazing them heavily with sheep after harvest in the fall and again for about a month in the spring. Achieving the right amount of stress on the plants is a matter of trial and error. Each year is different, and each variety is different. For this reason, white clover is notorious for variable seed yields. Seed is harvested in August. The hills of the north Willamette Valley are beautiful in mid-May, when the crimson clover fields bloom scarlet red. Crimson clover is an annual, planted in late September or early October. Crimson clover is harvested in late June and early July. As with the other clovers, it is swathed at night, when dew is on the plants, to reduce seed shatter. It's allowed to dry in the swath for about a week, then harvested with a combine using a belt pick-up header. Arrowleaf clover is an annual, similar to crimson clover in it's requirements. Like crimson, it's planted in the fall, but harvested later, in August and early September. Also like crimson, the flowers bloom from bottom to top, and the flower head will continue to grow taller and produce more seed as long as growing conditions are good.